New Delhi: The country’s gross value added (GVA) in agriculture and allied activities jumped to 5.3 per cent in the first quarter of 2018-19. This was driven largely by a strong show in the livestock, forestry and fishing segments, which account for 45 per cent of the GVA. It was also due to a big jump in foodgrains output, according to the fourth Advanced Estimate for 2017-18 (July-June). “Otherwise, you won’t get a growth of 5.3 per cent in agriculture and allied activities on a relatively high base of 3 per cent in the first quarter of 2017-18,” Madan Sabnavis, chief economist of CARE Ratings, told Business Standard. The growth was best in last four quarters. Also, the data released by the Ministry of Statistics and Programme Implementation (MOSPI) showed that there has been a slight uptick in prices as the difference between GVA for agriculture and allied activities at constant and current prices was plus 1.7 percentage points. This should be beneficial for farmers. Foodgrains production, according to the fourth Advanced Estimate of agriculture production released earlier this week, jumped to a record 284.83 million tonnes during the year that ended June 2018. This is almost 2 per cent more than the last that came in May and 9.72 million tonnes more than 2016-17. The data released by the department of agriculture showed that major gains have been made in pulses, where production in 2017-18 is now d to be at an all-time high of 25.23 million tonnes. This is around 2.1 million tonnes more than the final production of 2016-17. For the second straight year, pulses production has been over the estimated consumption of 22 million tonnes, raising hopes that if the trend continues, the country can well become self sufficient in pulses. Wheat production has been revised upwards by 1.06 million tonnes to a record 99.70 million tonnes for the 2017-18 crop year from its previous projection. In 2016-17, wheat output stood at 98.51 million tonnes. Similarly, rice output for 2017-18 has been raised by 1.39 million tonnes to a record 112.91 million tonnes from its previous estimate. This is higher than the figure of 109.70 million tonnes achieved in 2016-17. Production of coarse cereals has been revised upwards by 2.12 million tonnes to a record 46.99 million tonnes from its previous projection made for 2017-18 and is higher than 43.77 million tonnes during 2016-17. More than the jump in foodgrains production, the growth in livestock, forestry and fishing during the first quarter also seems to have played a big role in pushing the growth in the first quarter of 2018-19. “Around 44.9 per cent of the GVA of this sector is based on livestock products, forestry and fisheries, which registered a combined growth of about 8.1 per cent in Q1 of 2018-19,” an official statement by the MOSPI said. Meanwhile, experts said the growth of agriculture and allied activities in 2018-19 would also depend on how production of kharif crops fare in 2018-19 sowing of which is almost at its end. 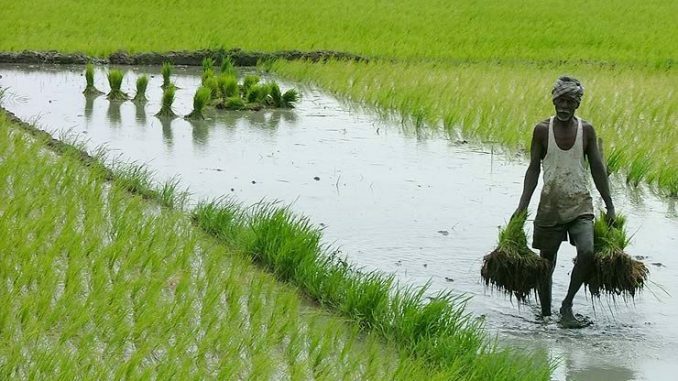 With the southwest monsoon fairly evenly distributed in most parts of the country, barring pockets of distress in Karnataka, Bihar and Jharkhand, agriculture ministry officials expect another year of good harvest in 2018. Latest data shows that till August, kharif crops have been sown in around 102.28 million hectares, less than a percentage down from last year.